Do you ever come home to an empty fridge but still want something delicious to eat? We recently returned from the Mid Atlantic coast. Without time for a trip to the grocery store, I wanted a simple healthy meal we could make from pantry ingredients. 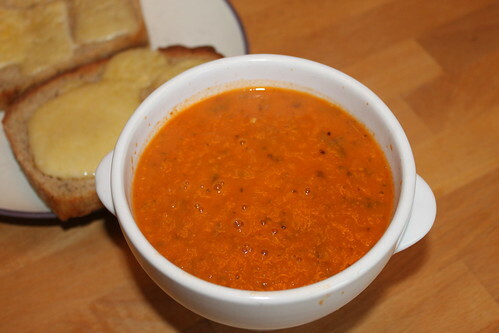 Knowing that we had plenty of home canned tomatoes in the larder, I invented this recipe for tomato soup and served it with toasted cheese. This tomato soup is made from only seven ingredients which are found in a well stocked pantry. The oven roasting adds depth of flavor and caramelized goodness. 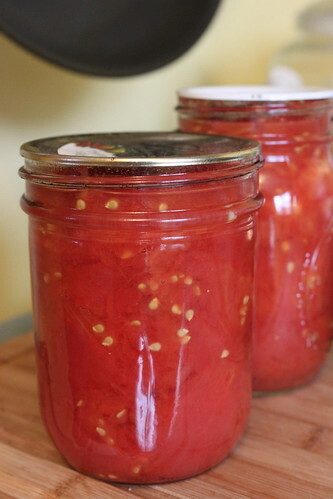 Strain tomatoes from their juice, reserving it for later. Place tomato pieces, fresh onion and garlic in a large roasting pan with a heavy pinch of salt. Drizzle olive oil over top and place in a 350 degree oven for one to two hours, stirring occasionally. Bring tomato juice + 1 cup water (use stock if you have it for richer flavor) to a simmer. Add the Parmesan rind, pesto block or herbs, and several twists of freshly ground black pepper. Remove onions, garlic, and tomatoes from the oven. Blend with an immersion or standard blender until smooth. Adjust seasonings and add the balsamic vinegar. Add to the juice mixture and simmer for a half hour. Serve warm.